About this object John McCormack of Massachusetts succeeded Sam Rayburn of Texas as Majority Leader in September 1940. On this date, newly elected Speaker of the House Sam Rayburn of Texas named Lindsay Warren of North Carolina temporary House Majority Leader. In the days following the death of Speaker William Bankhead of Alabama, Democrats expected a heated contest to fill the Majority Leader’s position left vacant by Rayburn’s ascension to the Speakership. The party had yet to decide whether it would caucus immediately to select a new leader or if it would wait until the start of the 77th Congress (1941–1943). Rayburn selected Warren to fill the temporary vacancy; Warren, already scheduled to retire from the House to accept a White House appointment, proved to be an ideal interim appointee. The Democratic Caucus met nearly a week later on September 25 and elected John McCormack of Massachusetts Majority Leader over Representative Clifton A. Woodrum of Virginia, 141 to 67. 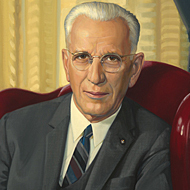 McCormack briefly stated he considered it "a trust to be exercised in the best interests of the Democratic Party and the country.” McCormack served as Majority Leader for nearly two decades, except for two Congresses when party control of the House switched: 80th Congress (1947–1949) and 83rd Congress (1953–1955). In the 87th Congress (1961–1963), following the death of Speaker Rayburn, McCormack became the 45th Speaker of the House.